Did you know that there are roughly 5 million different species of beetles in the world? Crazy, right? 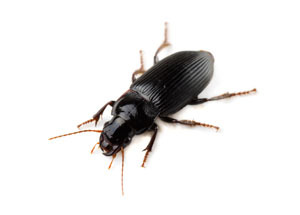 That can make it a tad difficult to figure out what exact type of beetle you may be dealing with on your property. Different species include Bark Beetles, Asian Beetles, and Borer Beetles--just to name a few. Beetles are easy to identify as they have a hard outer shell and wings that are used solely for flight. Most beetles range in brown to black in color but some can be green and even red. Beetles can cause problems if left untreated in or around your Waldorf home. Beetles can enjoy snacking on the vegetation outside and if too many end up inside your home, then the swarming and constant buzzing can become stress inducing. Also, species such as Powder Post Beetles have been known to lay their eggs within the infrastructure of homes as they tend to lay eggs in wood. This can prove costly and damaging to your home and the longer you wait to treat a beetle problem, the worse it will end up being. Calling a professional beetle exterminator can stop a beetle infestation in its tracks and save you a lot of money and help regain your Waldorf home.